One of India's leading airlines, SpiceJet recieved its first Boeing 737 MAX 8 aircraft from the US manufacturer on Friday, October 12th October The new arrival to the SpiceJet fleet is the first of up to 205 examples of the 737 MAX family the carrier has ordered from Boeing. SpiceJet will be using the aircraft to both standardise its fleet as well as expand its global route network, "We are excited to take delivery of our very first 737 MAX 8," SpiceJet Chairman and Managing Director Ajay Singh said, adding, "The induction of our first MAX is a huge milestone in SpiceJet's journey. These new aeroplanes will enable us to open new routes while reducing fuel and engineering costs, as well as emissions. The 737 MAX will dramatically reduce noise pollution and greenhouse gas emissions. Passengers will benefit from a large number of premium seats and, for the first time in India, broadband internet on board." "India is a fast-growing market for commercial aeroplanes and services," said Ihssane Mounir, senior vice president of Commercial Sales & Marketing for The Boeing Company. 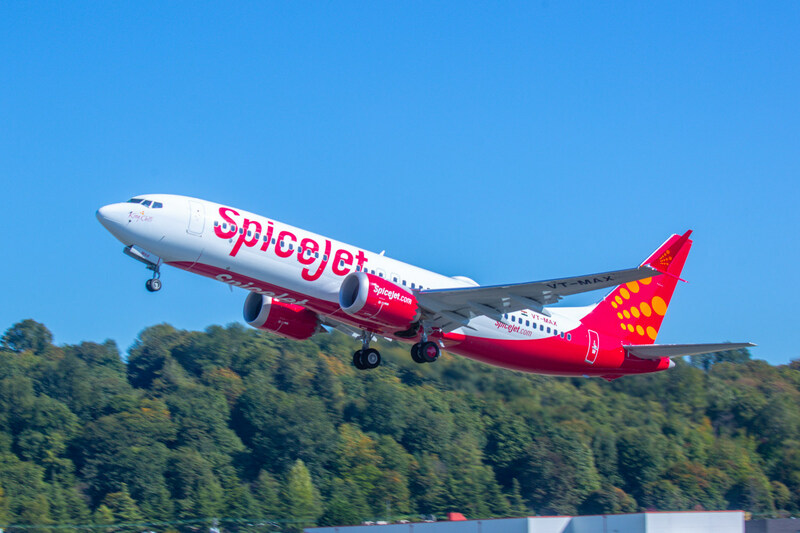 "The 737 MAX for SpiceJet is the perfect aeroplane for this market and it will become a key ingredient for long-term success, especially as oil prices continue to put pressure on airlines." The new aircraft are arriving at a pivotal time in the Indian commercial aviation industry, back on June 20th the Indian Government confirmed it had failed to find a buyer for its stake in debt-ridden national carrier Air India. While Etihad Airways backed rival Jet Airways has been struggling to pay wages on time to staff as costs and fuel prices soar.